Introduction: If one signed on to a social media site, checked a news website or, in some cases, even watched one’s local evening news during mid- to late February 2014, one may have encountered some surprising news: as predicted by “scholars” or “experts”, perhaps “according to Norse mythology” or even according to a mysterious “Viking calendar”, a “Viking apocalypse” was to occur on Saturday, 22nd February 2014. 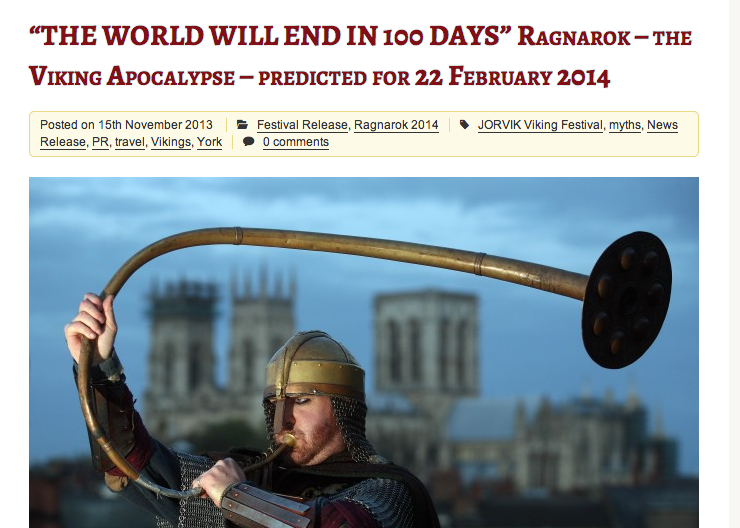 Viking Age specialists who encountered these reports were likely to have been particularly surprised; no such “Viking calendar” is known to have existed and, while an event that could loosely be described as a “Viking apocalypse”, Ragnarǫk, is foretold in various Old Norse texts, it is nowhere said to occur at a specific time. The present article serves as an analysis of the dissemination of this misinformation and briefly examines its context in modern popular culture. What do the Old Norse sources say about Ragnarǫk? A fair amount; references to Ragnarǫk are scattered among several key texts in the Old Norse corpus. While these references at times contradict one another and comparative material from other Germanic cultures is lacking, these limited sources make it possible to construe an image of this ‘apocalypse’ rich in details. The sources we have today, especially as compiled in the Gylfaginning section of the Prose Edda, form something of a cohesive, albeit often mysterious, narrative.